A health watchdog said a nursing home in Hailsham was 'good' but that it could make improvements in its leadership. Bowes House, a nursing home for the elderly in Battle Road, Hailsham, was inspected by the Care Quality Commission (CQC) in February. A report published last week said the service was 'good' for safety, effectiveness, caring and responsiveness. It 'requires improvement' for leadership. 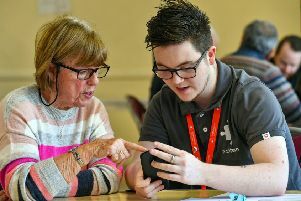 Bowes House, which is run by Care UK Community Partnerships Ltd, provides care for up to 90 elderly people, with many living with disabilities, dementia, Parkinson's disease and diabetes. Inspectors found that those living at the nursing home felt safe, and there were enough staff to meet their needs. Staff were described as 'very respectful', and one person said: "Staff are very good and always treat me with dignity and respect, nothing is too much trouble for them." Inspectors said those living at the home and their families were involved in planning their care. The nursing home also came in for praise for its dementia care, and staff 'had the skills needed to provide a tailored and person centred model of care'. The inspectors said: "Staff demonstrated compassion for people's wellbeing and a shared commitment to enhancing the quality of life for people. "They had worked with people living with dementia to redesign the care provided and the ethos of a person centred model of care was clearly embedded by the way every member of staff interacted with people." People had their own bedrooms and bathrooms and said that they liked the fact that visitors and family pets were welcome at any time, inspectors said. But improvements could be made when it came to leadership, the CQC said. Although staff felt able to express concerns to managers, and there were weekly meetings on performance and strategy, the CQC found there could be better auditing processes. Inspectors said: "Service management and leadership was inconsistent. Leaders and the culture they created did not always support the delivery of high quality, person-centered care." They said processes to audit medicine stock was not always 'robust enough' and that some medicine care plans did not contain 'clear guidance' to inform staff when a person may need the medicine or when a variable dose might be required. Inspectors said these issues were addressed with the manager and senior care team, and they confirmed 'they would put immediate measures in place to review the way that medicines are audited and update peoples care plans to reflect more detailed and person-centred guidance for medication'.